This book contains a sublime message for the whole world namely that philosophical and ethical questions, like scientific ones, are as urgent and relevant today as they were at the time of man’s first intellectual awakening. It has been written with great passion and love for the author’s race and religion and Sri Lanka’s spiritual heritage. The Revolt in the Temple points the way to practical policies in the post-war world, and puts forward ideals i.e Buddhist ideals, that can become real though universal acceptance. The rapid rise of Buddhism particularly in the West in the second half of the 20th century and the unceasing doubts that Buddhist thought has created in the minds of followers of Abrahamic religions in respect to the validity of their traditional religious beliefs, leading to mass scale abandonment of such beliefs in the West, with all their manifest cruelty to both man and animal, has raised the stature of the author D.C. Wijewardene, as a great visionary for his far sightedness in identifying Buddhism as the religion of the future for the entire human kind. What Karl Marx was to the worldwide communist movement through his writings ‘ The Communist Manifesto ‘ and ‘ Das Kapital’, D.C. Wijewardene was to the fledgling Buddhist nationalist movement of the post war period of Sri Lanka through his book ‘ The Revolt in the Temple’. It was a best seller among English educated people in Sri Lanka and it captured the popular imagination and spirit of the Buddhist public of a great past of a great Buddhist nation that produced the ‘Arya Vamsa’ (Noble Race). Anagarika Dharmapala, the fountainhead of the Buddhist Revival movement was dead (1933) by the time ‘ The Revolt in the Temple’ was published (1953). However ardent Buddhist nationalists like L.H. Mettananda carried the torch of Anagarika Dharmapala in the 1950s and were instrumental in preparing the Buddhist Commission Report entitled ‘ The Betrayal of Buddhism ‘ (1956) that resulted in the forming of the monk led ‘ Eksath Bhikkshu Peramuna’ and hundreds of Buddhist monks stepping on to the streets paving the way for a peaceful Buddhist Revolution through the ballot (1956). It was a watershed moment in the country’s history. The stigma of 450 years of unjust colonial rule effectively ended with the popular victory achieved in 1956. It was the rectification of the historical injustices committed on the Sinhala Buddhists during 450 years of colonial administration under three Christian powers i.e. Portuguese, Dutch and the British, and which rectification was urged in the Buddhist Commission Report (1956) and S.W.R.D. Bandaranaike’s undertaking to implement in toto the recommendations of the Buddhist Commission Report given at a mass public meeting held at the Colombo Town Hall before the April 1956 General Elections, that brought the Maha Sangha enmasse into the political arena. The ‘Sinhala Only’ was a secondary issue in the General Elections of 1956 though it is now being used a red herring by the reactionary NGO sector to divert attention from the main plank of Buddhist agitation i.e. seeking justice for crimes committed by the colonial powers. This book provided the foundational theoretical text that helped to inspire the Buddhist Revolution of 1956 which swept S W R D Bandaranaike and the MEP to power. The primary purpose of this work was to commemorate a great and unique event in modern times, namely the completion of 2500 years of a three -fold history. This history is that of the Buddhist faith, of the Sinhalese Race, and the Land of Sinhale (Sri Lanka). 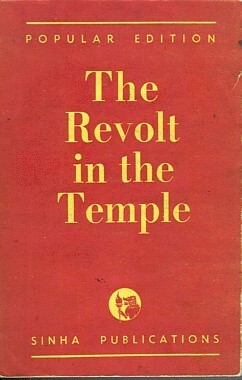 The Revolt In The Temple (Dharma-Vijaya Triumph of Righteousness) is a Trilogy. The first part, Nidana Katha or The Introductory story, contains the story of the Sinhala Race, The Second Part is the Kalyana Magga or The Path of Happiness, It is a exploration in simple language of the Buddhist Faith. The Third part is Rajjan Ca Paja Ca, or Man and the state. It is a must read book for all those seeking to understand the motivation and patriotism that drove the Sinhalese to resist the foreign incursions through an uncompromising loyalty to ‘ Rata, Jathiya and Agama’. Uncompromising loyalty to ‘ Rata, Jathiya and Agama’ is considered as ‘racism’ today by various pundits and some politicians use it to get to power, but when the get there , they do just the opposite to destroy ‘ Rata, Jathiya and Agama’ feeling from people in a very subtle way. If every different religion or race has the feeling of ‘ Rata, Jathiya and Agama’ , every different group will keep there identity but always associate it with the main concept ‘RATA’. No single group has a right to sublimate any other group than below its historic composition. Therefore subversive groups attack history and historic evidance first, teach rubbish in their own language. This is how LTTE has operated and is operating and now Jihadists are operating. Agree with you. It is a very important work for the Sinhala nation as well as Buddhism. This book is now out of print and is available as collector’s editions. I am fortunate to have a copy given by my father. I think the Buddhist groups in Sri Lanka should get together and ask the publisher to do a reprint of this great book. Make it also available freely on Google books and as a Kindle edition so that more people can read it. Even a paperback version would be great. Our stupid politicians such as CBK have banned the teaching of our history (Mahavamsa and Culavamsa in schools) and CBK wanted to stop the teaching of Buddhism and teach a mix of all the religions which will really confuse our poor kids. This stupid woman should be removed from politics. My thanks to both Senaka Weeraratna and to Cerberus for your information. After reading what you wrote here, I hustled over to Amazon and found 2 used books for sale. I bought one for approx 70 usd + 5 usd shipping; the second copy is still available if anyone else is interested in buying it! Thanks again! I will enjoy reading it.